(Nanowerk News) Tissue engineering is a medical solution that uses living cells to repair or replace structural tissue, such as blood vessels, bone, cartilage, etc. Polymeric hydrogels, in both solid and liquid forms, are used as a delivery system for living cells, acting as a protective layer to contain the cells for transplantation into patients to replace diseased or damaged cells. There are currently two types of hydrogels, solid and liquid; however, both forms of the hydrogels have mutually exclusive characteristics which limit their usage. While solid hydrogels provide a protective environment for new cells, they can result in trauma from surgical implantation. They also lack the ability to adapt and conform to the geometry and mechanical properties of the host tissue, which is required to ensure an optimal host-implant interaction. Meanwhile, injectable hydrogels are unable to retain its structural integrity after injection, making it difficult to retain the encapsulated cells. 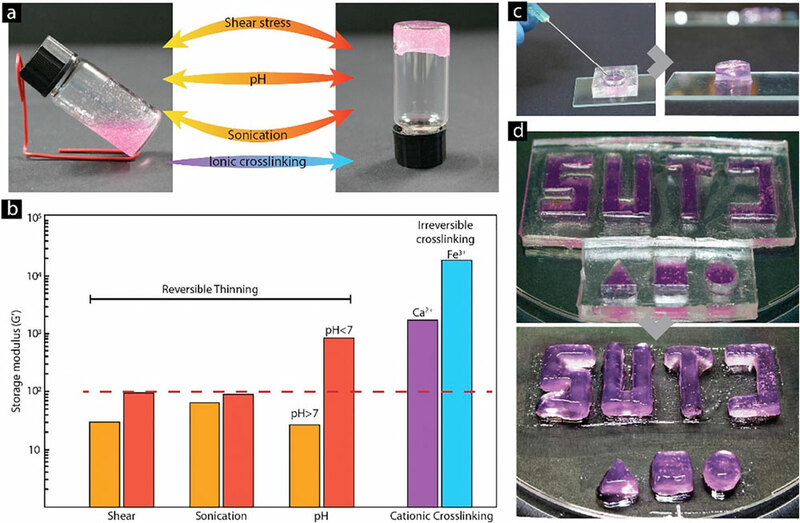 A potential solution that combines both characteristics of the hydrogels has been developed by a research team from the Singapore University of Technology and Design (SUTD). The SUTD researchers developed a thixogel made of 99% water and 1% of cellulose – the CNF hydrogel – which allows for its transformation from a solid hydrogel to a fluid when subjected to stress, and back to a solid hydrogel in less than a minute (International Journal of Biological Macromolecules, "Stimuli-responsive injectable cellulose thixogel for cell encapsulation"). It was also tested to be highly compatible with human breast cancer cells as well as mouse embryonic stem cells, signifying its applicability in tissue regeneration. Biological cells can be loaded into the CNF hydrogel when it is in its more fluid, less viscous state, and then subsequently implanted into a patient through a minimally-invasive technique, such as an injection. In its liquid form, the CNF hydrogel will also be able to conform to the complex, narrow spaces in the host's tissue before returning to its solid gel-like state. The CNF hydrogel in its more solidified state will then eventually be substituted with the patient's own tissue as it provides a platform to regenerate and repair damaged tissue during the healing process. CNF hydrogel is made of cellulose, the most abundant organic polymer on Earth and comprises 99% water and cell media. This enables cells to live and grow, making it a suitable medium as a carrier for healthy tissue and cells. Additionally, since CNF hydrogel's transition from a solid hydrogel to liquid is enabled by absorbing the stress, that stress is not transmitted to the cells, effectively allowing them to survive the transition process and ensure high cell mortality during delivery. "The versatility of CNF hydrogel and its high compatibility with human breast cancer cells as well as mouse embryonic stem cells provides a springboard for various applications not just limited to a cell-encapsulation carrier; CNF hydrogels can also potentially be used in bioprinting, which includes the printing of cells and artificial organs, as well as to reproduce complex diseases such as cancer in the controlled environment of a lab," said SUTD Assistant Professor Javier Gomez Fernandez.